I was fascinated by a graph Parke Wilde put up on his Food Policy blog a couple weeks ago, in which he noted that not everyone who supports biotechnology opposes mandatory GMO labels or vice versa. He proposed segregating people based on their views to two questions. Is GMO technology dangerous or beneficial? Should GMO labeling be mandatory or voluntary? 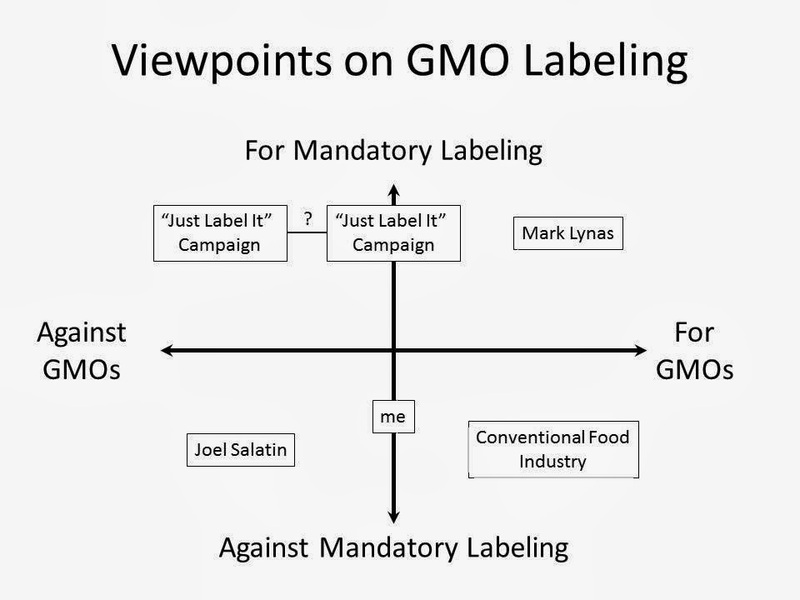 This scatter plot separates the two issues by putting attitudes toward GMOs on the horizontal axis and attitudes toward mandatory labeling on the vertical axis. I like Parke's distinction. But, I think there is something deeper going on here. It is politics. I've previously commented on the remarkably high correlations among voter's preferences for gay marriage, GMO labels, and size of farm animal cages. What this suggest to me is that there is a strong political-ideology undercurrent driving much of the food debates. In the case of GMOs, the evidence I have suggests that where one falls on the labeling issue (and somewhat on the GMO issue) is driven by political ideology. In a survey I did with Brandon McFadden in California just prior to the vote on mandatory labeling for GMOs, we found that political ideology strongly correlated with voting intentions. According to my calculations, moving from the "extremely liberal" category to the "extremely conservative" category led to a 22.5 percentage point reduction in likelihood of voting "yes" on Prop 37. Liberals are much more likely to want to mandate GMO labels. Interestingly, however, this isn't because they are more likely to think GMOs are unsafe. In a different survey I conducted this summer (nationwide survey, N=1010) , I asked people whether they agreed/disagreed that "genetically engineered foods are safe to eat." On a 5 point scale (1=strongly disagree and 5=strongly agree), I find that "extremely liberal" folks answer 3.05 on average and "extremely conservative" folks answer a 2.82 on average, a statistically significant difference. Liberals are (somewhat) more likely to believe GMOs are safe. So, there seems to be something of a tension between beliefs about safety and willingness to use the state to mandate outcomes one desires. I strongly suspect there is another dimension here that partially explains the liberal tendency to want to regulate GMOs: the tendency to see corporations and capitalism as corrupting forces - i.e., aversion to agribusiness in the food sector. Thus, even if many liberals support GMOs in theory (being "for GMOs" on Parke's graph), they may not in practice (being "for mandatory labeling" on Parke's graph).